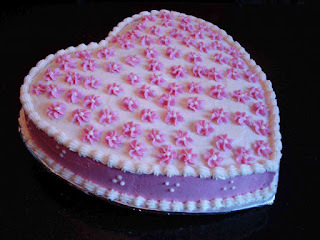 Wouldn't it be great if you can bake something like this on Valentines day? I'm planning to buy a couple of baking pans from Amazon.com and while I'm on it, I saw these lovely heart-shaped baking pans, which, I thought, are PERFECT for the coming Valentines Day. 2. Progressive International 3 Piece Springform Pan Set - the set include 1 9-inch heart pan, a 7-inch round pan and a larger 9.5-inch round pan. This could be a perfect gift to someone special this Valentines! Calling hubby! 3. Wilton 6-Cavity Silicone Heart Mold Pan - this silicone pan produces 6 lovely two-and-a-half-inch heart-shaped cupcakes or whatever you want to put in it. Now, here's one that's REALLY for petits fours! 4. Wilton Petite Silicone 12 Cavity Heart Pan - this is just like the one on top, but the hearts are a bit smaller...and as you see, you get 12 heart-shaped whatevers in one pop. 5. Kaiser Bakeware KaiserCast Heart-Shaped Bundform Pan - this heart-shaped 7x7x2-14-inch bundform pan is made with heavy-cast aluminum with 2 layers of nonstick coating for quick heat conduction and effortless release. By the way, the pan comes with recipes, guys! Kaiser Bakeware KaiserCast Heart-Shaped Bundform Pan, 7"
These heart-shaped baking pans are not only for the Valentines Day, they're for everyday cakes, too! Aren't they a gorgeous excuse to bake everyday? LOL. More heart-shaped cake pans are available here .